I’m going through my DVD’s of some good old school kung fu flicks and I found a gem I forgot I had…The Chinese Professionals (aka The OneArmed Boxer). Before Bruce Lee took the martial arts world over by storm, there was Jimmy Wang Yu. His martial arts movies are classic for 15 minute duels and fighting 50 bad guys at a time! Basically the bad guys come in and wipe out a whole kung fu school leaving one survivor (Jimmy Wang Yu), who also happens to get his arm cut off in the fight. He runs away and eventually is train in the “black fist” technique by an old master. He comes back to seek revenge on those who killed his master and took his arm! Wang Yu challenges a colorful list of bad guys from inflatable Tibetan Lamas to a Yoga Kung Fu master who circles around you walking on his hands. Wang Yu does a lot of damage here and this is one of his most memorable roles. 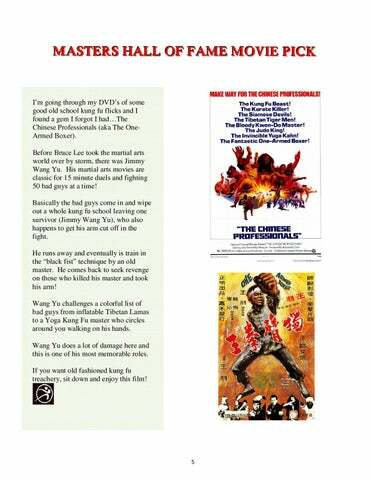 If you want old fashioned kung fu treachery, sit down and enjoy this film!